Sam the detective has a hairball of a problem on his paws. His friend, Sandy, the popular star of cat food commercials, is missing, the result of an apparent catnapping. The villains left a ransom note and clues that are trickier to unravel than a ball of yarn. While at least one perpetrator of the crime is decidedly human (a man was seen stuffing Sandy into a van outside the studio), the accomplices could be human or feline. Sam has a litter of suspects to choose from: Felix, Sandy’s understudy; and his manager, who wants Felix to have his chance at fame and fortune; James Blond, Sandy’s stunt double, who feigns disinterest in Sandy’s job until it goes to Felix; and the mysterious human, John Casey Jones. 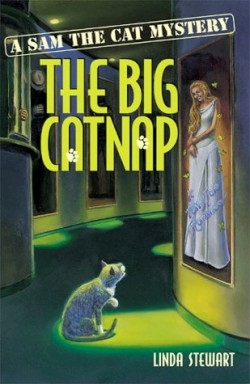 Also populating the story are numerous felines who aid Sam with clues or further intrigue: the fluffy and pampered Antoinette, Sandy’s sister; Spike, Sam’s capable Mr. Watson; Rosie, Sandy’s secret (and expecting) bride; Pickles, the one eyewitness to the crime; streetwise alley cats; and an assortment of characters who hang around the local deli, where Sandy went to fetch a pickle for Rosie before disappearing. Stewart has written seventeen adult crime novels and film novelizations, plus television dramas, and documentaries. Her experience in the adult genre is evident in this kiddie whodunit as her clever detective sorts through all the clues and ties up the loose ends that characterize any good mystery. This is the second in a series of Sam the Cat mysteries. Sam The Cat: Detective, Stewart’s first book for children, sold more than 240,000 copies and was nominated for the Mystery Writers of America’s Edgar Award. Young readers who enjoy matching wits with this clever cat will undoubtedly look forward to the next installment, The Maltese Kitten.